If you follow any wedding vendors on instagram, you've probably been hearing a lot lately about "styled shoots", but what exactly are they? For those not in the wedding biz, styled shoots are a way that creatives can come together and collaborate on a vision, network, create new content, and just generally have a fun time dreaming up beautiful scenes together. I had been dreaming of being a part of a styled shoot for a long time, but it took a chance meeting with Jennifer Dukes of Olive & Ivory Photography to really make my dream a reality. 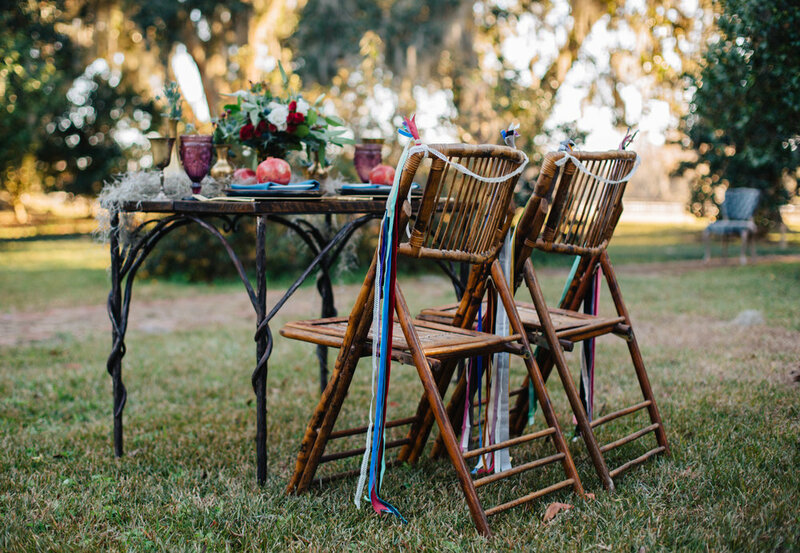 Once Jenn and I began talking, and she mentioned recently connecting with Tracey Bates of Huspa Plantation and we realized that between the two of us we might actually be able to pull this thing off! Within a week of our meeting, while photographing her children for their 2017 Christmas card, I was chatting with designer Amy Devito about coming on board for the photoshoot. The three of us immediately agreed that we wanted a darker palette of jewel tones and golds. Charleston may be the capital of pastels, but when given the chance to play, we all wanted to work on something a bit different. Huspa also isn't your typical plantation venue. While the property has countless great oak trees and the glimmering spanish moss that has come to define the lowcountry wedding aesthetic, Huspa Plantation's main house burned down decades ago and was replaced with a gorgeous Frank Lloyd Wright inspired building with crisp edges and windows for days. Amy was able to connect us with the amazing women of The French Eclectic Vintage Rentals, who graciously allowed us to have our pick of goregous pieces in their collection. And we all agreed setting dinner among the old plantation house ruins would perfectly complement the beautiful pieces that they loaned us. Next thing we needed to tackle? The dress! Luckily, I connected with Alicia Ward of Southern Protocol Bridal at a Charleston Bridal Association event soon after, and they offered to loan us any dress of our choosing! Alicia was such a pro, we had initial chosen another dress based off sample images, but she brought along Ivy & Aster's "Secret Garden" dress just in case and we all immediately fell in love. Southern Protocol also lent us a beautiful veil they custom made in shop, and some simple pearl earrings from Moon & Lola. 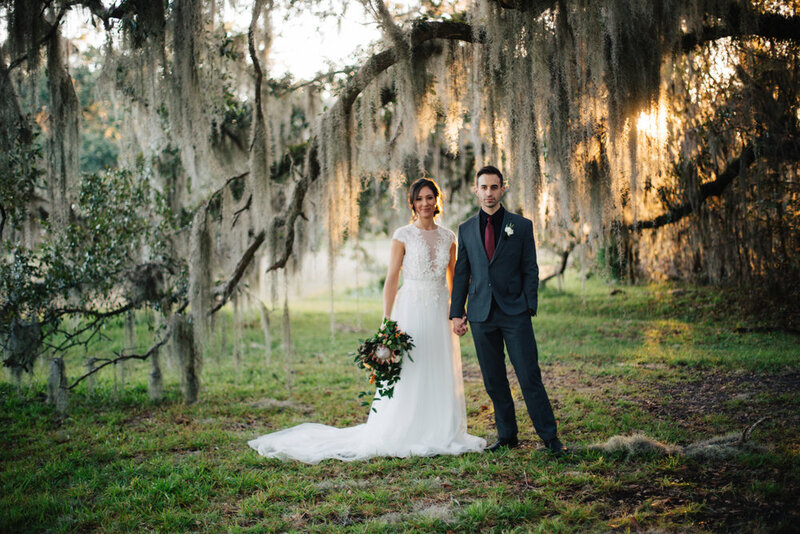 Makeup by Mariah with Pampered and Pretty and Hairstyling by Lindsey Donahue (Strawberry Blonde Salon) completed the look with a laid back elegance that went hand in hand with the venue's atmosphere. And of course, there's that bouquet! I'd be remiss if I didn't mention the BEAUTIFUL paper suite that Mollie Beach of Hadley Press created for the shoot. Of course in the rush of the day I only grabbed a few detail shots, but be sure and hop over to the Olive & Ivory blog for some gorgeous flay lay's that Jenn got of the full suite. Just before Christmas, I met up with Beth, Jamie, their dog Scarlett, and "Wanda" their Jeep Wagoneer, at their waterfront residence in the Old Village of Mount Pleasant. As if Beth & Jamie's property wasn't already amazing with its neverending dock and goregous oak trees, it's also steeped in history. Their home has had many lives, it was once referred to as "Shell Hall" and for a time served as the ferry station connecting Mount Pleasant & Charleston. When we got together on a typically balmy day this past December, we had a blast playing with some camping props, Christmas decor, and of course the gorgeous views! 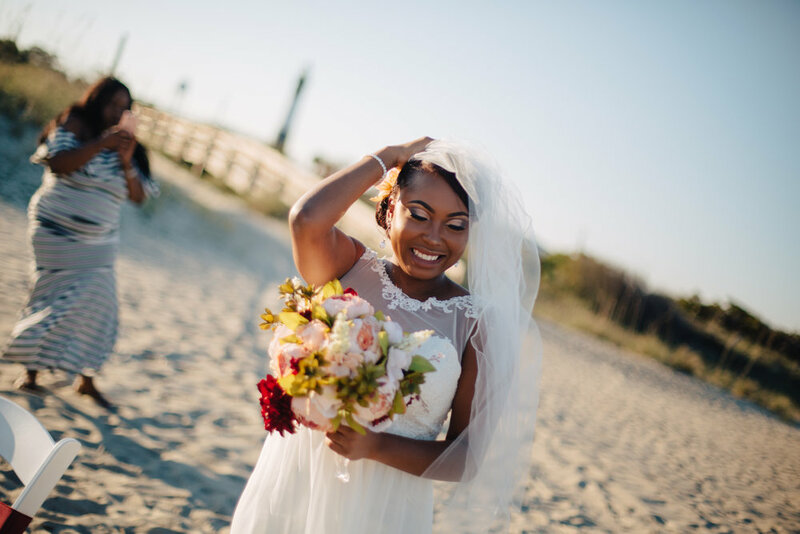 On a breezy Sunday afternoon, a small gathering of friends and family came together to witness Jaleesa & Frankie's intimate wedding ceremony on Tybee Island, GA. Set against a backdrop of the golden sunset and the Tybee Island Light Station, the couple chose a palette of neutrals with jewel toned accents that fit perfectly with the white sands and Georgian sunset. 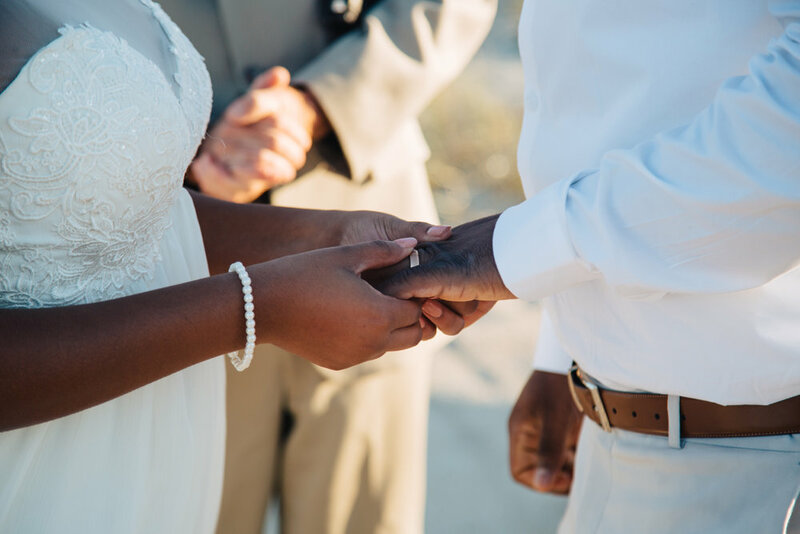 This sweet family played up the neutrals at White Point Garden in downtown Charleston. Colors. Usually when I'm asked by a client what they should wear to their photo shoot, they are focused on color. And with good reason! Choosing wardrobe colors for multiple people can be stressful, so simplify the process by limiting your group to three or four colors. I would recommend two neutrals and a statement color "pop". (Unless you're into all neutrals, which if you took one look inside my closet you would know I understand SO well.) Traditionalists will tell you to stick with two colors, but this tends to bring you into "matchy-matchy" territory. How many totally unique looks can a larger group come up with when they are limited to two colors? Not many. Long gone are the days of everyone in a white shirt and jeans, it just looks dated and too uniform. I'd say this rule goes for matching your children too. How many of us have looked back on childhood photos where we are wearing the same smocked front dress as our sibling and thought WHY?!?! (Is it just me? It can't just be me.) Instead, try choosing complimentary colors that flatter each other and create a cohesive look. Totally lost? Pinterest has millions of color palettes available for you to scroll through, just make sure not to get too far down the rabbit hole! Location. Where you've decided to have your portrait session can be a huge factor in choosing your color palette and clothing options. Say you're having a family photography session out on Sullivan's Island. The muted tones of a beach front photo shoot mean you can play up your color "pop's" a bit more. Think saturated bolder tones, to really make you stand out amidst the sand and sky. But perhaps you've opted for family photos downtown on Rainbow Row, or at one of Charleston's many beautiful gardens. Because of the vibrancy in your backdrop, you might want to consider a palette of neutrals or more muted color choices. Also, consider your location when choosing the dressiness and functionality of your wardrobe. A beautiful cocktail dress and heels can look amazing for a sophisticated downtown Charleston interior, but you'll be struggling through the dunes out on Isle of Palms in your stilettos. Season. This is especially important when planning a family photo shoot with little ones. Adults may be able to fake it but when kiddos are too cold or too hot they will let you know! It may be tempting to throw on wool sweaters and scarves for your Christmas Card Photos, but if your photo session is in South Carolina in September, it might be best to just embrace the southern holiday look. 'Tis the season! Style. Disclaimer: if you are a fashion addict, then do you! But if you're reading this, chances are you often find yourself diving head first into your closet and still coming up empty. My recommendation (and the rule I try and follow in my own wardrobe) is to stick with classic pieces. Trends tend to date your photos, and if you're taking the time (and spending the $) to have your photos taken professionally, you probably want these pictured to last. So simple silhouettes and classic cuts are generally best. And there you have it, just a few basic tips on choosing your family photo outfits! Did you catch our eclipse segment on ABC 4? Last month, I was featured on ABC News 4 and Lowcountry Live in a segment leading up to the total solar eclipse in Charleston. It was such a blast being interviewed by Erica and offering some tips on the best techniques for photographing an eclipse! Click on the photo above to see the full segment and brush up before Charleston's next total solar eclipse which is set to take place on March 30th, 2052! Okay, ignoring the existential crisis that question brings up. What's up?!? After 4 years of running my photography business I've decided to take the plunge and...blog? Over coffee with a good friend recently (who also happens to be a social media guru- cheers for talented friends! ), I was reminded that I haven't been the best at sharing with y'all. I guess I always assumed that I could let the photos speak for themselves, but when I think about all of my favorite brands/artists/businesses (oh hey, there's an entire blog post there!) what draws me to their platforms, aside from amazing product and talent, is really a chance to peek into the behind the scenes of another business or entrepreneur. So back to the question, who am I? If we haven't met yet, my name is Erin O'Connor and I'm a photographer living in Charleston, SC with my husband Will and our dog Larry. I started my photography business in Houston, TX before we relocated to Charleston in July 2016 for my husband's job. I moved to Charleston without any real knowledge of the city (Was I living under a rock? Not reading ANY travel magazines? Unclear.) and have since completely fallen in love with lowcountry living. Charleston is just a really great city for quality of life. The downtown has beautiful historic homes and shops, the beach is a short drive away, and the food completely lives up to the hype. So, after moving across the country every 3-4 years for a decade, we quickly made it a point to put down roots and ended up purchasing a little yellow house (First time homeowners! 80 year old house! What could go wrong??) in the Wagener Terrace neighborhood on the upper peninsula in Charleston. So what will this blog be? You tell me! I'd love to use this as a space to share tips and tricks I've learned working as a professional photographer, highlight some of the amazing spaces I stumble upon in and around Charleston, chronicle my on-going efforts (and frequent failures) at moving towards a more "green" lifestyle, and whatever else you're interested in. So, if you have any questions/topics/crises you'd like to hear my take on, just comment below and let me know!